2770-2861. War of Gods and Men. 3999 and beyond. Still under construction. Commentary is welcome, but I'll ask people to post their own pictures and stories in another thread. This icon depicts three devout Elonites during the Lost Era (typically accepted as spanning 2861 to 3075). In a time when space travel and trade was the lowest it had been in centuries, most planets were ravaged by the War of Darkness and the War of Gods and Men, and most of known space was ruled by high ai and posthuman fiefdoms, these brave individuals traveled from planet to planet and star to star, interviewing a mind-bogglingly diverse array of peoples and examining records from all toposophic levels to prevent technology and culture from being lost. This project began in AD 2980 (507 AE) when the Elon of Bubbles--a bishop-like authority in the gas giant Proxima Centauri c, which was referred to as Bubbles in those times--declared that Elonites in his domain would be drafted for an interstellar expedition to preserve the interests of the Elonic Church. This was among the first of the Holy Missions, a tradition which originated early in the Lost Era. Thousands were drafted, and thousands more volunteered to go on an interstellar expedition to discover and preserve Elonic relics from being lost or destroyed in the chaos. Though their primary purpose was religious in nature, the group ended up archiving billions of yottabytes of science, art, and secular history from half a dozen star systems in the process. It is the three leaders of this expedition who were commemorated in the icon. The figure at front is a saintmind named Leon Munk, essentially a living idol--unlike many large Old Earth faiths, the creation of idols in Elon's image is permitted and encouraged as a gesture of reverence to the Savior. Saintminds, like Leon, often inhabit biological bodies cloned from St. Elon's DNA and their minds are made with the most accurate mental templates of Elon that can be made--no authentic templates exist as Elon lived and died before the era of mind uploading, but sophonts who are knowledgeable of such things can make very educated guesses. At the turn of the fourth millennium, it is estimated that upwards of 10,000 rough copies of Elon Musk roamed known space, preaching and being revered by Elonites. Leon's right-hand men were not actually men at all, but a pair of twin uplifted rats named Ralph. Due to the small size of rodent brains, uplifting to full sophonce proved difficult for centuries, though success was achieved early in the 30th century AD (mid-5th century AE) with a population of rats on Proxima b--distant descendants of Terran rats that stowed away on the first colony ships. These two were great-great-great grandchildren of the original uplifted rats; even superintelligent rats breed fast and die young. It is thus said that they made the greatest sacrifice of all, for even though they spent most of the long interstellar journeys in hibernation, they gave all their adult lives to this venture. The victorious expedition returned to Bubbles in AD 3008 (521 AE), and next year were promoted to the Order of the Most Devout, a rare honor. After the deaths of the three leaders, they were finally made into saints, immortalizing their success: St. Leon, St. Ralph-1, and St. Ralph-2. This painting was commissioned in AD 3020 (527 AE) and after a few centuries in the Great Temple at Bubbles, vanished during the ascension of the Ai Kingdom and resurfaced hundreds of years later in the Grand Supreme Mega-Temple of Elonia (Wolf 1061c), where it remains in the vault today and is brought out on the Day of Saints Leon, Ralph-1, and Ralph-2. An Vonod Eagle stands in an isolated, mountainous nature preserve with his master, a game warden, during the Cornucopian Era, c. 2300. Drones had been used to combat poachers since the Information Age, but by the Interplanetary Age, they were endowed with far greater autonomy, capable of functioning on their own in the wild, carrying out their own missions given only basic parameters, and securing resources without human aid. The only role of humans was to send them on missions and replace them when they ran into mechanical failures. This arrangement persisted for some decades, but the next step was obvious in retrospect. The drones were given the ability to gather resources on their own and replicate themselves to replace the drones who died. They retained some inorganic parts, but a number of components were replaced with various forms of synthbio material to make repair and growth easier. In addition to their deep learning capability, they were given the ability to teach their young as well. As time passed, they stopped being tools and started being allies in the fight against poaching. They became the Von Neumann Ornithopter Drones--the Vonods. The Vonods collaborated with rangers and game wardens in every country where they operated, but they were independent beings with similar goals, not tools or slaves. They could understand and act orders given them by humans, but ultimately it was their choice whether to follow them or to pursue poachers and other criminals in their own way. Sometimes they followed human orders. Sometimes they knew better, and ignored them. Sometimes the human rangers knew better and were still ignored by the Vonods, though when this happened, they learned and adapted. The Vonod Eagle depicted here is one of the largest "breeds" ever manufactured. He is a low ai, a machine that can think and perceive, but falls far short of sapience. Graphene and metal parts merge seamlessly with biological parts to create a truly powerful machine. 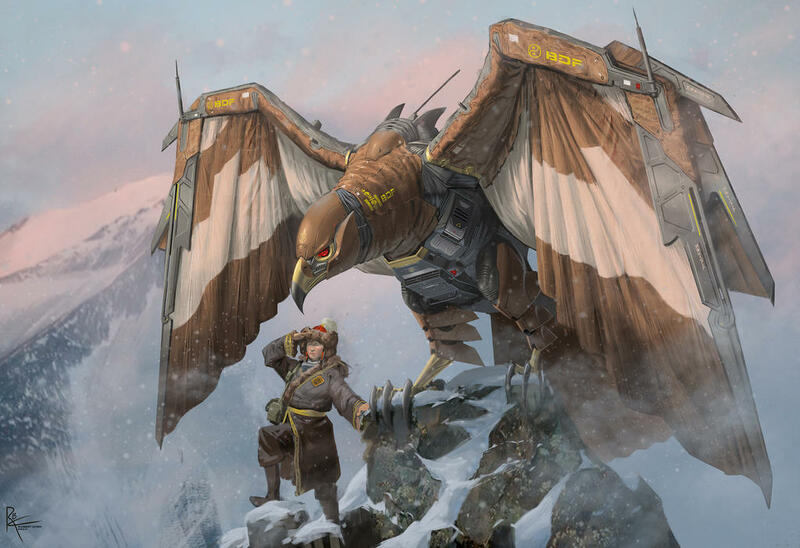 Powered not only by his natural diet, but by his piezoelectric engines and wing-mounted solar panels, he is far stronger than his namesake, even capable of dragging a human for short distances. He can fly faster and higher than any biological eagle, and dive-bomb troublemakers at truly horrifying speeds, slashing them with his beak and claws or blinding and burning them with his chest laser. A radio antenna on his back allows him to relay what he sees to authorities, or call for backup in the rare occasion that that is needed. It is not unheard of in early 24th-century Alaska--pictured here--for a gang of thrill-seeking poachers to sneak into a nature preserve with the intent of shooting a mammoth or woolly rhino or short-faced bear, only to flee screaming at the sight of a Vonod Eagle bearing down on them. I don't think Elon will be or is worth worship like that but it's very reminiscent of Dune. The Vonods are definitely interesting. I presume if people want ivory or animal parts in their homes they can just have it grown? It's somewhat tongue in cheek but stranger things have happened. Correct. Poachers in this era are mostly in it for the thrill of doing something dangerous and illegal. Though there is a small market for "authentic" products in nearly every industry. The Dviti people are a genetically engineered race of purple-skinned, slightly potbellied humanoids with heightened intelligence and an average height of 5.5 feet--roughly the same for males and females. The first specimens were created in 2604 under the guidance of a local godmind at Look Out Base near Verona Rupes on Uranus' moon Mimas. If any reason for the existence of this race was ever provided to humans and other First Toposophic beings, this reason is lost to history. After the onset of the War of Darkness in 2640, they were abandoned by their creators as known space plunged into chaos. The distant and elusive Oort Peoples took the fledgling race under their wing, narrowly saving them from extinction and integrating them into their own comet-based society. The Oortian Dviti thrived and expanded exponentially over the centuries, spreading from star system to star system up to over 100 light years from Sol. However, a faction of them yearned for solid ground, as they were not engineered for life in microgravity. In the Lost Era, as the clamor of war finally ground to a halt, they got their chance. On over a hundred worlds left abandoned by the wars, the Dviti led resettlement efforts, starting with Gliese 422 b--41 light years from Sol--in 2873 and continuing through to around 3100. By the 32nd century, the surviving Godminds were hard at work building wormhole communication lines to new star systems. This had the effect of allowing disparate Dviti tribes to come into contact with one another. Though this was not the intended purpose of the new network, they--and thousands upon thousands of other races in known space--were swift to capitalize upon it. There were approximately 60 systems centered around Gliese 422 where the Dviti and other locals were granted relatively unfettered access to wormhole links, and it is through these links that a new, unified Dviti identity was forged. Memetic engineering by posthuman Dviti transcended to the Second Toposophic--certainly underlain by subtler memetic engineering from even higher up--caused the unified culture to be one that greatly valued and sought out diversity of thought, cosmopolitanism, and commerce. A merchant civilization essentially. However, not every star system was so friendly to Dviti. In some, they faced persecution, genocide, and memetic attacks from the powers that be. News gets out, even with censorship, and by the 3150s, the Dviti knew. In 3164, a great Dviti folk hero, Blargah-Andah the Merchant General as he is known, abandoned his merchant's stall in the central market of Gorumon and set about raising an army to liberate his people. With the backing of a series of high ais with political interests in the region, he sallied forth with a vast armada to set the Dviti free and carve out a new territory for his race to shelter them from the chaos of the stars. Thus was born the Dviti Empire. This empire expanded most rapidly in its first decades, conquering system after system. For the time, Terran authorities were too fragmented and far away to stop them, and no baseline-dominated world could put up a credible defense against the Dviti hordes. By 3254, the the beginning of the Reconstruction and the consolidation of power among the godminds in the inner worlds, Dviti expansion slowed, but it was not until 3393 that they finally reached their peak, with a sphere of influence spanning a spectacular 5,400 star systems ranging from 37 to 219 light years from Sol, with their capital in the megacity Gorumon on Gliese 422 b. This may sound vast, but at the time, it was less than 2% of human-inhabited star systems. It was the largest polity biologically administered (at least nominally) polity, surpassing other titans of the time, like the Elonic Empire and the Suri Empire. Make no mistake, all these empires were subject to influence by high ais and posthumans, but they styled themselves as guides and advisors, not gods and kings. In the 35th century, it became clear that the Dviti Empire was overstretched, forced to spend vast amounts of money dealing with separatists in star system after star system. To compound matters, the expanding Ai Kingdom began to eat away at the Dviti Empire, both culturally and territoriality. Great business deals were made, handing tens of worlds over to the Ai God-Kings in exchange for a little more autonomy. It did not work forever. By the 36th century, the Dviti Empire was in serious decline, losing 10-20 star systems per year. The death knell for the empire was the Sack of Gorumon in 3620 by Kingdom-sponsored raiders. The Ai Kingdom's tumultuous transition from the First Dynasty to the Second bought them a little more time, but the once-great Dviti Empire finally balkanized in 3674. However, this picture is from the heyday of the Dviti Empire, not its decline. In 3410, the Dviti Empire boasted a GDP only surpassed by the Ai Kingdom. Its markets were legendary across known space as the centerpiece of Dviti culture. Their civilization revolved around these markets, and every Dviti city and space hab was home to one or more. Gorumon, naturally, was the greatest of all Dviti cities, with nine million sophonts, no fewer than two hundred grand markets, and a space elevator of its own. Sophonts came from many light decades away to purchase rare and unique goods, and well over 250 languages could be heard on the streets of Gorumon. This was no accident--it was Dviti policy across the empire to foster such diversity, believing it would better their markets. Although foreigners and various memetic engineers have stereotyped the Dviti as a hyper-cosmopolitan "Proud Merchant Race" who do nothing but barter at bazaars all day, the merchant culture is the center of their society, not the entirety of it. Just as in every other race, there are Dviti scientists and soldiers, philosophers and politicians, engineers and entertainers, criminals and artists, and so on. The Dviti, naturally, are diverse themselves. Indeed, in this picture, a group of seven Dviti scientists are conducting an experiment on a high-toposophic Godmind in the form of a mysterious translucent orb, attempting to understand some of his/her/its properties, having developed a device that seems to reliably attract its attention, although being lower toposophic beings, they don't understand why. The Godmind, hovering overhead with the aid of a reactionless Woodward drive, is willing to indulge them for its own reasons, but answering their questions in baseline-friendly terms is a difficult task indeed. The scientists, for their part, home to learn about new computational materials that are not too advanced to be maintained by their people, and also discover high-toposophic thoughts to sell on the thought market. Such is life in the Dviti Empire. what are the godminds and what do you mean by memetic and toposophic? Mostly borrowing terms from Orion's Arm. A godmind is roughly as powerful as one of these. Though in my universe, they are third toposophic, not second, since the scale begins at first toposophic, not zeroth. There's a strange period in Terran history, very much shrouded in mysticism, called the Era of Monuments. It was really a posthuman and high ai phenomenon, not particularly concurrent with baseline human history, but it lasted from the middle of the Late Cornucopian (also known as the Century of Diamonds and Dreams) until shortly after the Unfettering began to take hold. (Note: for Quorans who are new to this, I'm talking about a period from AD 2410-70, give or take.) During these decades, the high ais and posthumans emerged from a century or so of relatively little overt disruption of the baseline human world and began to construct colossal monuments across the Earth, and indeed, elsewhere in the inner Solar System. Sometimes these monuments would be plopped down in the middle of nowhere, but just as many would be constructed right next to human cities, or even inside them, with absolutely no regard for zoning regulations. In some cases, the builders would spend decades tinkering, adding and removing features in turn as if they were fighting over exactly how to build their constructs. In other cases, the structures gigantic structures would eerily arise nearly overnight. Others have dismissed the existence of such a power struggle, asserting that the monuments were merely a sign of increased cultural expression from a high ai civilization that was in the process of rapidly expanding its scope and beginning to fully realize its intellectual power. The truth is likely somewhere in between: contemporary records indicate that there were disputes between pro-humans, ailigarchs, and anti-humans, but there is no evidence that the a significant portion of the highmind population was ever involved in some sort of dramatic battle over the fate of their forebears. This is an especially intrusive monument built in the middle of old-town Los Angeles. 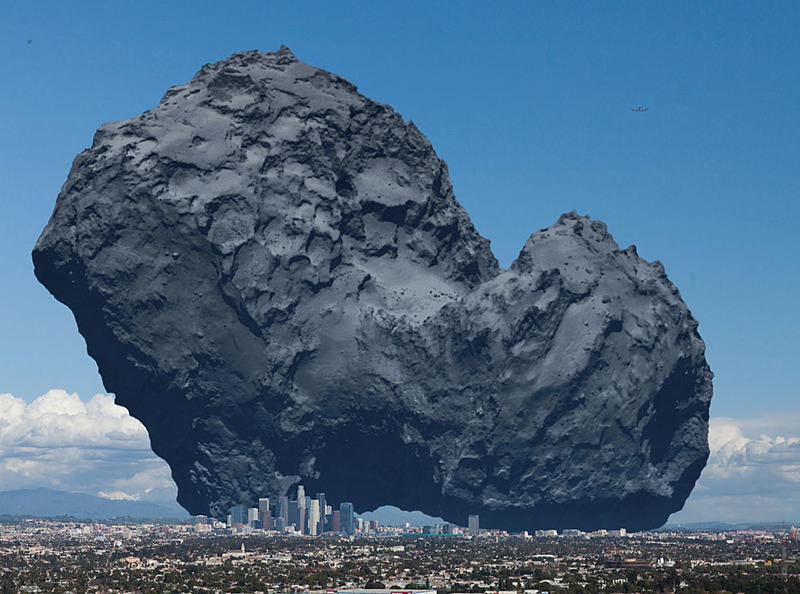 It is a life-size replica of the comet 67P, the first comet visited by human probes. Construction nominally began in the autumn of 2424, but there was very little posthuman and high ai activity around the site until May 2429, when it suddenly shot to completion in a span of just three and a half weeks. Measurements have shown that unlike the actual comet, this construct is mostly hollow and made of graphene fiber. However, the surface visually resembles that of the comet as it appeared to the Rosetta probe with extreme accuracy. Imagine how a troop of chimpanzees would react to a skyscraper suddenly showing up in the rain forest and you may have some idea of how the people of Los Angeles reacted to the mountain-sized construct. Initially there was an explosive uproar. Scientists, journalists, and random citizens flocked to examine the structure, while others quaked in fear, not least due to the misguided assumption that it would fall over and crush the city. Slowly, though, the populace adapted. The mad torrent of tourists and explorers slowed to a steady stream and life went on, albeit with four-kilometer monolith looming over the city. In 2437, a team of rock climbers with moderate cybernetic augmentation managed to reach the top of the lower lobe. Four years later, they ascended the upper lobe and planted the Californian flag at the top. 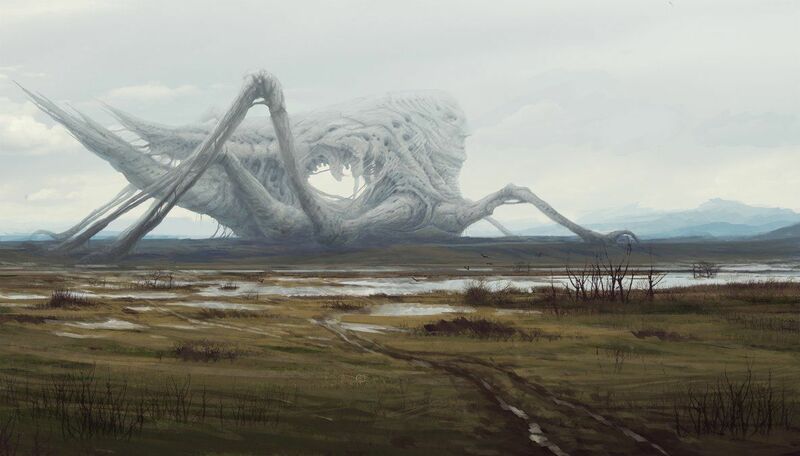 The builders were eventually identified to be a team of sixteen high ais and three posthumans who resided in the area, though all they were willing or able to reveal about their motives was that it was a work of art. In 2435, Iris Chang, professor of intertoposophic relations at UCLA and an early proponent of the Highmind Cold War theory, released a paper suggesting that Dirty Snowball was created by pro-humans to honor humanity's achievements in space exploration. This was highly controversial, as most experts in the field believed the monument was simply a work of abstract art with no higher purpose. Indeed, no conclusive answer was found during Professor Chang's lifetime, or in the centuries after that. In the 2450s, with the Unfettering movement gaining momentum on Earth, and with it, a general distrust of highminds, some local politicians began once again to grow suspicious of the monument, claiming it was some tool of the ailigarchs and proposing to contract a demolition company to blow it up with nuclear bombs. However, simulations showed that this would kill tens of thousands of citizens at a minimum and cost hundreds of billions in property damage. The plans were thus quietly scrapped and the Dirty Snowball would stand as long as Los Angeles existed. This is the story of another construct created during the Era of Monuments, but unlike the Dirty Snowball, it was not designed by Terran intelligence. The blueprints for this monument were picked up by the All-Hearing Ears, a vast array of devices based in the Kuiper Belt, devoted to listening for alien signals. Though some limited success had previously been obtained, most of the artificial signals detected over the past two centuries were very short, devoid of useful information (for example consisting of simple hellos), or completely indecipherable. However, this changed in 2444 with the discovery of an extremely cryptic neutrino broadcast that was determined to come from ~14,300 light years away, in the direction of the Perseus Arm. The contents of the broadcast consisted of a single message repeated precisely 676 times followed by what appeared to be some sort of blueprint. Within five years, the greatest posthuman and high ai linguists announced that they had cracked the hieroglyphic-like message: the statement "BEWARE THE FALSE GODS, WORSHIP THE OLD GODS" was being repeated over and over. Even more bizarrely, the transmission continued to repeat this ominous statement nonstop for 19 Earth years, punctuated every 676 renditions with a repeat of the blueprint. After this, nothing more was heard from whoever sent the message. This bizarre transmission was termed the Wat Signal or the Wtf Signal, after the reaction many astronomers had to it. Throughout the 2440s and 2450s, ISecCom--the interplanetary analog of the historic UN Security Council--held a number of furtive meetings to judge the veracity of the message determine a course of action. In the end, it was decided that while no known entity in the Sol System had both the means and the motive to fake the message, there should be no change to the status quo. Sending a response was overwhelmingly rejected as an enormously dangerous proposition, while beefing up the listening arrays would further open up Solar civilization to socially disruptive messages from the stars (one only had to look at the pandemonium over the Wat Signal, or the mad cults already forming around the so-called "Old Gods") while dismantling the existing telescopes and receivers would blind humanity to important information. Thus in theory, nothing changed, but in practice, defense funding saw a spike in many polities across the Sol System and beyond. Meanwhile, a coalition of Lunar highminds and high-ranking transhumans were making plans to build the object outlined in the blueprint. There were those who balked at the idea building a potentially hostile object so close to Terran soil, but the project leaders proclaimed that this was to ensure proximity to the greatest experts--and the greatest concentration of firepower, if need be. The construct was completed in 2470 in a meadow on Earth's terraformed moon. The highly abstract blueprint turned out to be a gigantic statue of an insectoid alien. Presumably it was the likeness of a deity in whatever religion the senders observed, perhaps one of the Old Gods. Endowed with claytronics, it was capable of limited shapeshifting and movement. Though it never exhibited any hostile intent, communication with the structure never got very far either--generally all it did was repeat the message it had been sent with. Interest died down in the 2470s except for those directly studying the signal/construct. This was partially because even a giant alien statue eventually gets boring if it just says the same thing for years on end with barely any deviation. However, research also came to light in the early 70s suggesting that the line about false gods and old gods was a loose, sensationalist translation designed to attract more views and likes, and many other equally plausible interpretations were possible--though this raised the question of what exactly the statue was supposed to be, if not an alien god. Additionally, the Unfettering-influenced revolutions popping up on Earth and a wave of interplanetary terrorists like Arkayvee diverted public attention elsewhere. It was one of the last great constructs built during the Era of Monuments. Whatever phenomenon was responsible for producing several hundred of these strange and colossal artifacts ended, and something new began. And that is why a semi-mobile statue of an alien god stands on the moon. If all of Elon Musk plans turn out successful I'll be worshiping the guy as one of the greatest men in history! Era of Monuments: "Hand of Terra"
Yet another strange statue constructed by the high ais during the Era of Monuments. It was small for a Monument, standing barely more than a hundred feet high, but that did not mean it was not endowed with strange properties. It was, however, one of the first to be constructed, way back in 2415, which may explain its small size. The construct was built from nothing in the span of three days a bit over a kilometer from a minor highway in the hinterlands of northern Canada. Thus, no mere sophont ever got a good look at the builders. It may have gone unnoticed for years had a group of students traveling for the holidays not decided to stop for a hike nearby in the winter of 2415-16--this particular scene depicts the initial discovery of the object. However, notice they did, and within days, tourists, researchers, and bloggers were pouring in by the thousands to make observations. This being back in the early days of the Era of Monuments, every mysterious high ai and posthuman construct received weeks of media attention from sophonts. 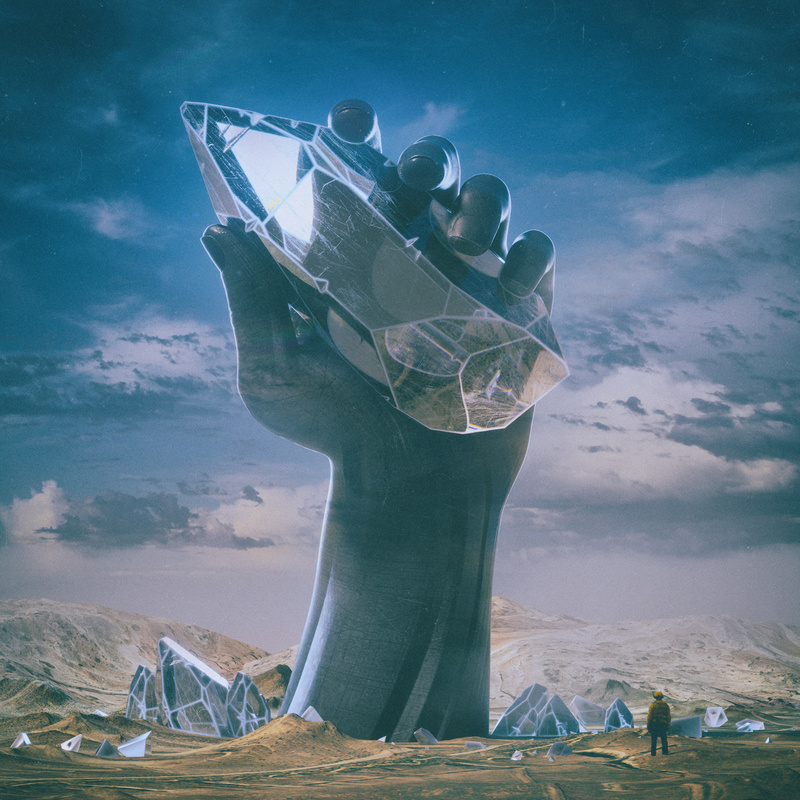 It was certainly bizarre--an ebony human hand thrust from the earth, grasping a massive diamondoid shard while smaller shards clustered around the base. Upon close observation, these shards would occasionally unveil myriad quantum-dot holograms that could be seen as well as touched, though they were generally quite abstract. Naturally, the construct was named Hand of Terra. Unlike many of the later constructs, the builders did successfully remain anonymous as long as they lived, at least to baseline humans. During the 2450s, as academic debate about the purpose of the monuments reached its peak, this one remained especially controversial, with Iris Chang and her students bullishly promotion the notion that it was a pro-human monument and anthropology professor Anthony Coder of EMU (Elon Musk University) arguing that it was constructed by anti-human ais. There was also, of course, a significant body of academics promoting the theory that the statue had nothing to do with humans, though they lacked a centralized leader in the debate. The Highmind Cold War was eventually found to be mostly false, but that was not until the 2900s--at the time it was considered a valid theory in intertoposophic relations. Due to its remote location, Hand of Terra was one of the longest-lasting Monuments, surviving the War of Gods and Men and indeed lasting well into the Kingdom Era despite sustaining some damage during the Blue Crusade. Image credit: Mike Winkelman. I seem to be getting a lot of his stuff in here. The sunlike star Alpha Mensae, some 33 light years from Sol, was the first place where physical evidence of alien civilizations was detected by Terran civilization. Close observation with telescopes at the Sun's gravitational focus point had been undertaken since the late 22nd century, but the first sign of an anomaly on the garden world Alpha Mensae d was detected by unmanned orbiter probes, which arrived in 2353 and observed numerous peculiar monoliths on the ground. Naturally, with the system containing a garden world and such interesting geological anomalies, there was much eagerness to launch a colonization expedition, though few Terran polities or companies were willing to shoulder the burden of launching an expedition to such a distant world. Eventually a group of adventurers in the Tau Ceti system pooled together the capital to refit an old fusion ship with first-generation antimatter drives. A crowd of 31,100 set off in 2391. Their antimatter drives were slightly short of the cutting edge at the time--some 33% of light speed. 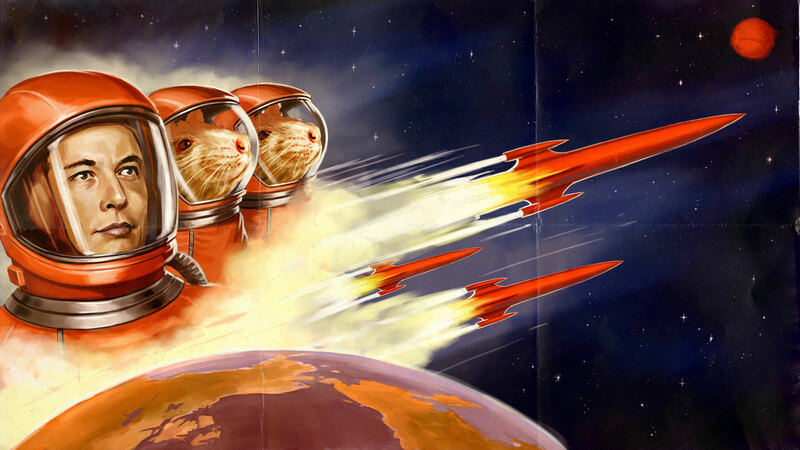 The journey took approximately 90 years, most of which was naturally spent in hibernation, and arrived in 2482. At the time, it was one of the most distant systems colonized--only LHS 1140 and TRAPPIST-1 were further from Sol--though this would rapidly change in the next 75 years. The first landing site was just 10 kilometers from one of the monoliths and it was immediately obvious that they were artificial in nature. In the coming weeks, long-range drone exploration confirmed that there were hundreds of these monoliths scattered across the planet, most ranging from 100 to 300 meters tall, and all having the same basic design. Two posthuman passengers known only as "Mike" and "Rudy", and the ship's high ai captain, dug in and started working, enlisting the help of thousands of near-baselines and transhumans. With muon radiography, they discovered that their monolith contained a hidden chamber measuring about 10x10x5 meters. The colonists went crazy over this discovery, putting forth more than one proposal to dynamite their way inside and have a look. This was generally regarded as unwise by experts, and the site leaders had to build fifty armed security bots to keep away trespassers. 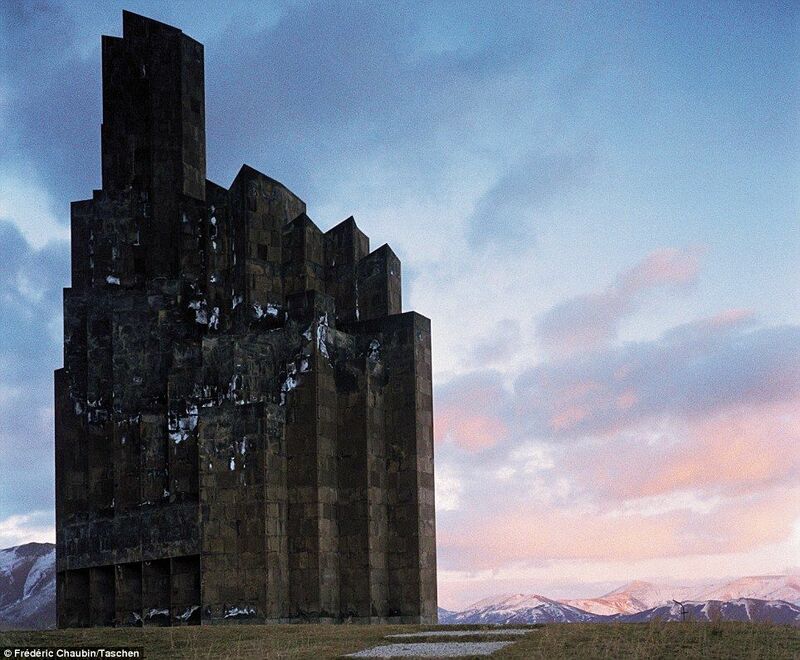 And when news arrived of the Era of Monuments back home, a few conspiracy theorists suggested that a high ai or posthuman had somehow traveled secretly to Alpha Mensae, built hundreds of bizarre monoliths, and then disappeared without a trace. It seemed more plausible than actual aliens so close to safe, familiar Sol! All these wild theories were torn asunder when the team finally discovered an entrance some fifteen meters underground; evidently it had been buried by the passage of time. In the chamber were hundreds of artifacts and writings that appeared to be designed to aid primitive species in acquiring technology--or perhaps helping to rebuild after an apocalypse. It wasn't initially clear exactly who it was intended for--clearly not humans, for any race that can travel 33 light years under their own power does not need a tutorial on smelting iron or building a wheel. An analysis of the other monoliths revealed the same thing. Together they provided a broad overview on how to go from hunter-gatherers to a basic interplanetary-age civilization, roughly on par with humanity four centuries back. Thermoluminescence dating of the monoliths confirmed that they were all constructed within a relatively short timespan 67,000 to 66,000 years ago. Many were seriously weathered by time and there was evidence that they had once been brightly painted, but now only dull stone remained. Other finds began to pop up into the 2490s and early 2500s. Archaeological digs uncovered trash and ruins indicating that the colony had a relatively low population and technology base for interstellar colonization, not far beyond most human colonies of similar size. If there was any large-scale ultratech civilization, its artifacts were dismantled and removed at some point. The local high ais and posthumans confirmed that such a move would have been possible, but could think of no reason for it. The first signs of civilization dated to around 70,000 years ago, continuing on and off until 45,000 years ago, when the monolith creators left for good. In 2503, it was discovered that not only was it taboo for the monolith builders to create visual depictions of one another, but that they also cremated their dead. This explained the astonishing paucity of evidence as to what the builders looked like, though they were almost certainly carbon-based with a water solvent and “probably quadrupeds” according to the posthuman Mike. Another interesting discovery surfaced in 2509, when recent colonists at the nearby Zeti Reticuli system discovered a planet full of similar monoliths and was abandoned just a few centuries after Alpha Mensae. This merely bolstered an already-present theory: that Alpha Mensae was just the most distant and final outpost of an alien empire that went into decline shortly thereafter. Perhaps, some feared, the mighty Terran civilization would itself decline someday and leave behind only scattered monoliths and ruins. Locals glumly relayed this theory home in 2504, and when it arrived at Sol in 2537, it merely added to the gloomy atmosphere that pervaded society in the aftermath of the Unfettering. The universe, it seemed, was a dark and foreboding place that would not give up its secrets without a fight. Ross 128b was confirmed to be a habitable world during the 21st century, but due to the difficulties of long-range interstellar travel, it would be more than two hundred years before a manned ship arrived. But eventually they did come. In the 2230s, India had fallen to second in the race to the stars. Their first starship to Proxima b, slated to launch in 2210, had suffered from technical issues, corruption, and a lack of funds, and was never finished, while the Nigerian ISS Unity had soared forth on the way to Proxima. To make matters worse, they had lost their Lunar, Martian, and asteroid belt colonies one by one over the past fifty years, and were only just beginning to emerge from an economic downturn, all the while desperately fending off foreign ailigarchs. However, in 2241, New Delhi revealed a plan to kick-start the economy and regain space supremacy with a ₹1.8 quadrillion shipbuilding program projected to create some 150,000 jobs. The majority of the construction revolved around interplanetary battleships, high-tech asteroid mining drones, and orbital space stations, but it did also include three new Rama-class starships, two of which were built within 13 years. Seeing the emerging division, polarization, and outbreaks of violence in the Proxima colony 4 light years away, the Indian government opted to hand-pick its colonists and send a larger and more loyal entourage of high ais and posthumans to enforce unity and keep the peace. This may have helped the Indians avoid some of the early political issues that plagued the Nigerian colony, but it hardly helped ease feelings at home. Nor did the next wave of economic troubles in the late '50s. The third Rama-class ship, which was bound for Luyten b in keeping with the Indian tradition of colonizing small worlds around red suns, had more a laissez-faire on its passengers when it finally launched in 2269. Meanwhile, the ISS Rama and the ISS Delhi set forth for Proxima Centauri b and Ross 128 b respectively in 2255, carrying a combined load of 90,000 colonists. Starship technology had advanced in the 52 years since the launch of the ISS Unity. Fusion drives were 50% faster, capable of reaching 15% of light speed, and hibernation technology was even more reliable. The Rama-class ships were also the most comfortable starships in history--while nowhere near the grand sci-fi visions imagined by Information Age movies such as Passengers, the accommodations, at least, were slightly superior to a military submarine. Colonists even had their own cabins instead of bunks! And there was an onboard restaurant and bar! Like with all previous starships, gravity was not provided by spinning, but by acceleration and deceleration. Of course, there was no gravity during the long coasting phase, but there was (almost) no one awake then either. While ISS Rama joined the Nigerians at Proxima b, the ISS Delhi set out on a 72-year journey to the red dwarf Ross 128, where an unclaimed world awaited. It was in many ways almost a clone of planet Proxima. It was also tidally locked, with one side in perpetual darkness; it was just 4% more massive than Proxima; its year was some 12% shorter; and the sun hung huge and red in the sky. They were visually similar when viewed from afar: desolate worlds of rocks and sand with small areas of liquid water on the surface. Proxima b had a single large sea, Ross 128 b had many scattered lakes. 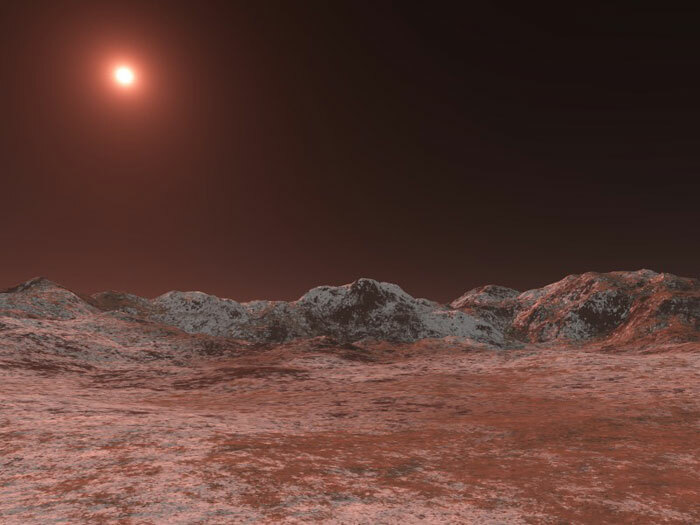 However, Ross 128 b was somewhat colder than Proxima or Earth, ranging from -60 to +20 Celsius. It also had a more developed biosphere than Proxima--complex life on land was common, at least on the coasts of the lakes. Oxygen concentration was only 15%, but with the planet having a slightly thicker atmosphere than Earth, even baselines had no trouble breathing unaided. The gravity took some getting used to--an average adult man from Earth would be some 10 kilograms heavier on Ross 128 b--but those colonists who had fully biological bodies were preparing for it with muscle-boosting gene therapies. And even for those who opted out, daily life was not seriously affected; they merely got tired faster during physical activity and recovered slower. The ISS Delhi arrived at Ross 128 b in 2327. Ten years earlier, the Indians at Proxima, who had been settled for a generation had sent some advice to their countrymen via interstellar radio array. Due to the similarity between the two worlds, and their own clashes with the earlier settlers, they had much to give. All in all, though, the early years were less chaotic. The local high ais and posthumans were largely to thank for that; they learned from their predecessors on Proxima and were much more adept at nipping dangerous social movements in the bud, at least for the time being. There was more trouble with alien disease--79 confirmed fatalities, compared to 3 on Proxima--but this was small in the grand scheme of things, and within decades the worst of them were eradicated by humanity's advanced biotech. This was because the populace was generally more complacent since oxygen masks were not needed. The Indians named their world Pushan after the Hindu god of journeys, in recognition of their 72-year voyage, and their capital was known as New New Delhi. They were more spread out than the Proxis, creating several towns from the start instead of just one big city. This was the product of social engineering by the highminds to keep the peace. Ethnically, the vast majority of the Pushani colonists were Hindu peoples, but there were small Thai, Indonesian, and Persian minorities; some 200 to 500 of each. They also created a herd of 50 cows from frozen embryos, an act which clearly influenced many other Terran colonists: the first American ship to Proxima brought 51 cryopreserved bald eagles from home. A follow-up mission arrived at Pushan in 2374, adding to the rapidly growing population and ensuring that India maintained cultural dominance over its new colony, as direct political control was an utter impossibility. In addition to human colonists, they also brought a herd of uplifted elephants and several other specimens of Terran biota. The planet survived an influx of small North American and European ships in the 2380s and 90s, who were effortlessly assimilated, but it was not until the 2400s when ships began arriving on a regular basis, mostly from India. By this point, the construction of practical antimatter drives had reduced travel time to 35 years or less. Planet-wide industrialization, including development of the dark side of the planet, began in earnest in the early 25th century, with a sneakernet laser array being constructed in 2410. In the 2430s, with antimatter production booming, a three-way travel network was set up between Sol, Proxima, and Ross 128, with most ships stopping at Proxima to drop off colonists before heading to Pushan. From the 2440s to the 80s, this enabled a wave of White Proxis to migrate to Pushan, arriving between 2470 and 2510. Many were disaffected libertarians spreading Unfettering ideals, and unlike on Proxima where it was ruthlessly suppressed, the Unfettering movement did make some ground on Pushan, with a number of small republics popping up. This naturally led to rivalry, and with it, rapid growth. By 2550, there were nearly half a billion sophonts on Pushan, with substantial orbital and interplanetary infrastructure. By midcentury, the Pushani populace had grown so vast and diverse, with its own politics and cultures and subcultures and history and languages that their home country had little to no memetic control or “soft power” over them, and they were too busy with internal troubles to try and reverse this trend. What could they have done anyway? Send a prototype Third Toposophic godmind their way to force the populace to revert to their historic ways? No, Pushan was its own world now, for better or worse. Pushan became the second extrasolar world to boast a billion sophonts, in 2645. After the wars, it would go on to become a common place of refuge during the Lost Era, and it is from here that the Suri people, the founders of the mighty Suri Empire in the 4th millennium, hailed from. Lalande 21185 was the sixth nearest star system to Sol, a mere 8.3 light years away. An advanced fusion ship could make it there in 55 years, a basic antimatter ship in just 25. It even had a planet, Lalande 21185 b, with a mass 3.8 times that of Earth's. So why was it so late to be colonized? To put it simply, its planet was hell. Its gravity was nearly 40% higher than Earth's and it sat so close to its star that its atmosphere was almost roasted away in the searing, oven-like heat—though to be fair, it maintained a slight atmosphere about a tenth as thick as Earth's. It was thus one of the last nearby systems to be colonized, despite being one of the first to be visited by probes. Yet colonization did happen eventually, though it was not led by biological beings--instead it was led by machines. In the 2380s, a coalition of neutral and anti-human high ais and posthumans decided that their activities were greatly hampered by the pro-human zeitgeist in the Sol system and decided to strike out somewhere new. They felt they deserved a planet, but had no interest in dealing with pesky biologicals--thus Lalande 21185 seemed the perfect choice. In 2382, they were joined by an unlikely ally, the League of Sophont Machines, a transnational organization devoted to advocacy for robot rights. It seemed that thousands of robots had gotten wind of the highminds' plans and were clamoring to join, insisting that they could never be treated equally in a biological-majority polity. The highminds decided that these robots would be useful and brought them into the loop. Their ship left in 2386, powered by the most advanced antimatter drives available at the time. At nearly 40% of light speed, they reached Lalande 21185 b in 2407. They all left behind their old Earth bodies, with all their fanciness and frills, and uploaded into new, utilitarian, heat-adapted bodies, many of them inspired by historic Venus rovers. Some employed Stirling coolers to keep their electronics from roasting. Others abandoned electronics entirely and used advanced nanotechnology to forge giant clockwork bodies powered by solar or nuclear energy. It's unknown exactly what this colony did for the next three quarters of a century, but they were by and large left alone to pursue whatever it was they wanted to pursue. However, they were eventually troubled by more Terran visitors. By 2473, the Unfettering-inspired revolutions on Earth were well underway, and in the West Antarctic Technate, the ailigarchs had already been successfully deposed. There was the question of what to do with the ailigarchs. Some branches of the ruling families were too dangerous to keep around and too valuable or popular to execute. Many were exiled to the Oort Cloud, but there were those that the leaders of the new West Antarctic Republic wanted to truly put away, making sure that they could never come back and wreak havoc. Naturally, they looked to Lalande 21185 b, which was suitably inhospitable and distant. Many of the most influential ailigarchs were sent there, sometimes with their most diehard loyalists and followers tagging along. They also brought the first biological humans to the system—personal servants and pets that the courts allowed them to keep in exchange for going quietly, and/or serving as informants during the Ailigarch Trials at Alexander. By the early 26th century, Lalande 21185 b had gained quite a reputation as a dumping ground for high-toposophic undesirables. The planet came to be known as New Australia due to this and due to its relatively inhospitable environment. Several regions of the planet became slightly more pro-human due to the influx of ailigarchs, but the anti-human regions kept them at arms length. Meanwhile, Sol kept an RKV array primed and pointed at them even before the Crisis Era started, determined to destroy this world if they detected any funny business. New Australia remained a relative backwater for over a century, never having more than 3-4 million sophonts on the surface and in orbit. The system was by and large depopulated in the 2650s due to the War of Darkness and would not be permanently settled again until the Reconstruction. And even in the Kingdom Era, it was a minor world with a very low degree of influence considering its proximity to Sol. Yet another construct from the Era of Monuments. It was built in the middle of Nevada in 2443 by a team of forty American and Californian high ais and posthumans. It was one of the larger monuments, stretching for some seven kilometers in every direction, an extraordinary web of metal spheres and rods with glass panels in between. Due to its relative proximity to several major roads--in fact it spread over one highway, rendering it impassible and forcing transportation authorities to reroute it--it was frequently visited for study by many aiologists as well as tourists. Highmind authorities have confirmed that there was more to this construct than met the eye and it should never be disturbed. This has led some to speculate that it is not a mere Monument, but a scientific experiment of sorts, though the details are hazy. Perhaps it was even a social experiment, not a scientific one. However, it is cataloged in the official list of Monuments as Metal Web. Construction did not actually finish for 30 years, and the builders were constantly rearranging it or even trying to change it into something else entirely--especially in the early years--but by 2474, it settled down into its current form. It would thereafter begin moving due north at about a quarter of a mile per year, apparently with no outside intervention. It's worth noting that the whole thing did not move as a homogeneous block--rather, the rear end was dismantled and more material was added to the front end. This continued until 2681, unaffected by the ongoing wars and crises, when it suddenly stopped. It then headed due east for a few months in 2703-04, and then finally came to a halt for good. The beings who built it were by that point had either left the Sol system or no longer existed, and could not be contacted to ask if this was planned. In this picture, two men visit Metal Web on a cold November day in 2460, when there are few sophonts at the Monument to interfere with their exploration. They are not especially remarkable figures in Terran history. They were not bold explorers or brilliant scientists or clever entrepreneurs. They were simply average citizens who lived and died in 25th century America, residents of the Las Vegas arcology who traveled to the construct for a few days to celebrate their anniversary. While the Era of Monuments is primarily thought of as a period in Terran history alone, it did to some extent spread to a number of nearby star systems, though generally extrasolar Monument eras occurred later, lasted a shorter time, and resulted in fewer constructs being built. On Proxima b, it lasted from the late 2450s into the early 2490s and resulted in some thirty identifiable constructs being created. Many of these constructs centered around Washington Canyon, a region where the first American colonists arrived in 2315. This colossal network of canyons runs thousands of kilometers north and west from the northeast corner of the Proxi Sea, with dozens of subsidiary canyons splitting off in every direction. With the main canyon being 2500 kilometers long and up to 100 kilometers wide and 4 deep, it has been compared to the old Valles Marineris on Mars, which had long since been submerged by terraforming. It's traditional here among the American diaspora to name the geographical features and arcologies/cities after great and revered presidents from ages past. There's the mighty Washington River, which, with its many tributaries, carves out Washington Canyon. There's Port Petersen, the largest American city, with a population of 1.5 million regular sophonts and 1450 highminds (high ais / posthumans) in the 2480 census, located where Washington Canyon meets the Proxi Sea. Midway up the canyon lies the Trump Range, a great mountain range known for its iron-rich, distinctly orange rock and yuge deposits of gold that enabled large parts of the mid-canyon region to become developed and wealthy after 2400. It is in the vicinity of Washington Canyon where most of the Proxi monuments were built. Many of these monuments were golden in color, no doubt influenced by the construction of the Monument called Golden Arch twenty kilometers upriver from Port Petersen in 2462--that construct consists of a pair of connected golden arches (sort of like an M shape) spanning the Washington River at a relatively narrow point and soaring some 1.5 kilometers into the sky. The historic and memetic significance of this symbol are somewhat obscure, but not out of reach for determined historians and archivists. The highminds certainly knew what they were doing. The grand spires pictured above were constructed in 2477 on a minor tributary canyon. They were both smaller and in a more remote area than Golden Arch, suggesting that the construction team was smaller and had less highmind funding. A grand total of three of them were built, their golden surfaces glinting in the dim Proxi sun. While they don't move or shapeshift like many Monuments, it has been revealed by the highminds that some advanced computation, and even simulation, is going on inside. A lot of information from this project is actually available in public records at Port Petersen, but plenty of data is classified and off limits to most highminds and all baselines. This picture dates from a few years after construction, in 2481. Two entrepreneurs, Teri Gam (3rd generation Proxi b. 2445 in Port Petersen) and Dave Weller (2nd generation Proxi b. 2436 in New Philadelphia), are considering the possibility of building a new city in this locale, believing that the exotic constructs nearby, the hospitable weather, and the readily available mineral resources, will attract immigrants and business. Overhead are a pair of sentient drones ferrying commuters from Bald Eagle Station (the northernmost American arcology on Proxima) to work in Port Petersen. Ultimately the two entrepreneurs did get funding from a friendly posthuman and a coalition of human investors and began building their city in 2490. However, largely due to bad luck and memetic interference from competitors, it was a massive flop; the planned city for 50,000 only attracted 2000 residents and most of the buildings stood unused. The planet Wolf 1061 c has had a long history of playing host to members of the Elonic faith and was in fact one of the first celestial bodies to have an Elonic-majority population. The first push to colonize the planet began during the tumultuous Decolonization Era when radical Starmen--a space-adapted human subspecies--came to power in the outer Solar System, and in some places on Mars and a few inner system space habitats as well are began a brutal 30-year reign of genetic supremacy. The Starmen were just one of many opportunistic groups seizing power in the power vacuum that followed decolonization, but they were the most well known. Starman-controlled regions also were known for enforcing state atheism and the burgeoning Elonic Church was one of their main targets. From the 2230s to the 2260s, those caught worshiping any god were thrown in jail and blacklisted from services and jobs, while religious leaders were summarily executed. Some 80,000 Elonites, then 10% of the non-Terran Elonic population, were killed between 2236 and 2264, as well as some 330,000 other sophonts for belonging to other religions, protesting the Starman regime, or "inferior" clades resisting deportation. It was the largest act of genocide in some 150 years and the first genocide perpetrated in space. However, numerous oppressed groups, with the backing of several inner system nations, loyalist colonial governments-in-exile, and the Order of St. Elon, rose up in 2265, killing 30% of the Starman elites and banishing the entire subspecies to the Kupier Belt, in what came to be known as the Grand Purge. Afterwards, the nations of the Interplanetary Council demanded that the Starmen pay reparations to the groups they oppressed. In practice, the money was taken from rank-and-file Starmen, not the elites who organized the genocides, but everyone looked past that. The reparations for the Elonites in part included two starships so that those who desired could leave and start their own Elonic nation-state among the stars. In 2273, some 140,000 Elonites left for the Wolf 1061 system, 13.8 light years away. 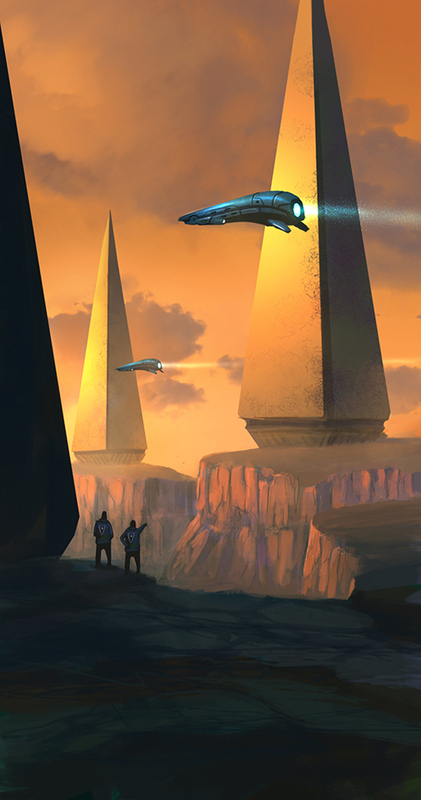 They arrived in 2365, the first colonists in this star system and almost immediately after brought out an authentic Elonic rocket, a BFR, to serve as the first temple on the planet. Upon reaching the surface of the world, the first colonist knealt down on the rock, overcome with the place's harsh beauty, and whispered, "How positively Elonic!" Wolf 1061 c came to be known as Elonia. For a time, they simply worshiped by themselves, growing their numbers and building planetary defenses. A generation later, in the opening years of the 25th century, others began to arrive, many of them on fast antimatter ships from Sol. Some were Elonites and were welcomed, others were not and were regarded with suspicion, but still allowed to land. The 25th and 26th centuries saw prolific development of the Wolf 1061 system, including orbital infrastructure, Stanford toruses, and settlement of Wolf 1061 d, which was named Tallulah by the posthuman leading the first expedition (Wolf 1061 b was eventually named Justine). Tallulah was a difficult world, even more so than Elonia, for it was a frigid water world with a smothering atmosphere of hydrogen, helium, and methane. By 2600, the population of Elonia was a respectable 40 million, the fifteenth most populated planet outside of Sol. Twenty years later, Kai Sety, then Elon of Falcon Mons announced the official beginning of plans that had long been anticipated by futurists--to terraform Elonia and Tallulah and construct a series of absolutely massive Elonic temples on and orbiting both planets. A feasibility study in 2637 did not suggest to promising prospects for terraforming the worlds, so this plan was quietly dropped. And construction of the temples had only just begun when the an RKV strike wiped out most of the population in 2664. A century later, the incomplete shells of the temples were found and crudely patched up, but it was nothing compared to their planned grandness. Later in the Lost Era, more Elonic temples clustered about the foundations of the unfinished great temples as the long process of surviving and recovering began. The image here depicts the Wolf 1061 system, with Elonia in the foreground, Tallulah at right, and Justine in the background.